Surrounded by lush green forest and several spectacular mountain peaks, Big Lake is just an hour’s drive from Bend near Santiam Pass on Highway 20. Located in the Willamette National Forest near Santiam Pass. Several beautiful mountain peaks can be seen from the lake. Just 47 miles northwest of Bend. Accessible during the winter via cross country skis, snowmobile, or snowshoe. 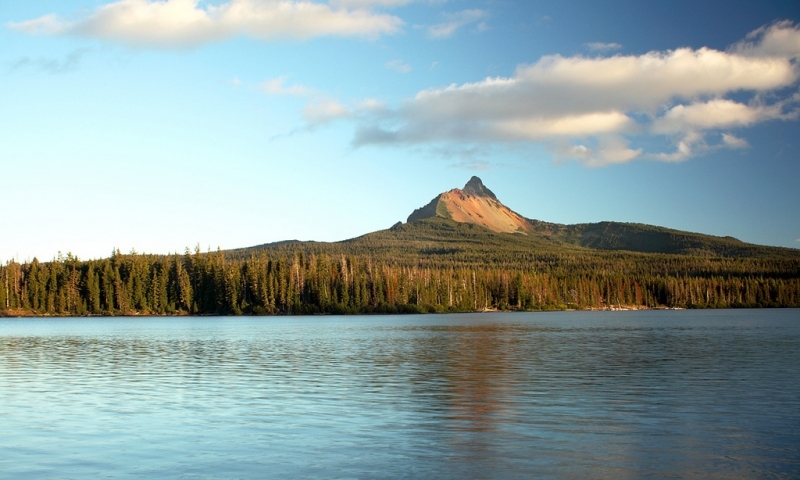 Nestled in the Willamette National Forest is a beautiful alpine lake simply known as “Big Lake”. About 47 miles northwest of Bend, this scenic lake is a popular recreational area for locals and visitors alike. During the summer you can enjoy camping, fishing, swimming, ATV riding, and water skiing at the lake. Hikers can explore the nearby Pacific Crest Trail from late spring to early fall. Winter recreation in the area includes skiing, snowmobiling, and snowshoeing. Big Lake boasts views of several peaks, including Mt. Washington, Hoodoo Butte, and Three Fingered Jack. Big Lake is about 47 miles northwest of Bend via Highway 20. It is about four miles south of Santiam Pass. During the winter the only way to access the lake is on cross country skis, snowmobiles, or snowshoes. Boating and Water Skiing –With over 225 surface acres of water, Big Lake is a popular summer destination for motor boating and water skiing. Camping – There are two campgrounds near the lake – Big Lake and Big West Lake. Hemlock, fir, and lodgepole pine provide ample shade and beautiful scenery for campers. ATV Riding – The area around the lake has several USFS off road trails that are accessible to all terrain vehicles. Fishing – Bring your pole and cast a line for rainbow trout, cutthroat trout, or brook trout while enjoying breathtaking views of nearby peaks. Winter Recreation – Those who visit the area in the winter can enjoy cross country skiing, snowmobiling, and snowshoeing in a literal winter wonderland. Hoodoo Ski area is nearby for those who prefer downhill skiing. Big Lake has an elevation of 4, 649 feet. May through October is the easiest time to access Big Lake. The lake is situated just off the Old Santiam Wagon Road.